Syrian Kurdish militia fighters rejoice after recapturing the northern Syrian town of Tel Abyad from Islamic State last month. So where do things stand in the bloody war between the Kurds and the Sunni jihadists over Syria's north? And is there a realistic possibility that Erdogan might intervene? First of all, it should be noted that the Islamic State offensives this week carried all the hallmarks of barbaric brutality with which this organization has become associated. This needs emphasizing because the slaughter of 223 civilians in Kobani last week failed to gain the global media attention it deserved. It was overshadowed by the attack in Tunisia against Western tourists, and the bombing of the Shi'ite mosque in Kuwait. The Islamic State's failed offensive caps a decline in its fortunes in northern Syria since January. The failure to destroy the Kurdish Kobani enclave, acknowledged in January, was the first stage in the slow rollback of Islamic State in Syria's north. Since then, the Kurds, supported by US air power, have pushed the jihadists further back in the direction of the east and south. This culminated last week in the taking of the strategically important border town of Tel Abyad and the linking of two of the three Kurdish cantons along the Syrian-Turkish border – Kobani and Jazeera. The Kurds then pushed eastward to Ain Issa, bringing them to 50 km from the capital of Islamic State in Raqqa. It was at this point that Islamic State launched its counterattacks against Kobani, then against Tel Abyad, and also against the regime army in Hasaka. These attacks have all now been repulsed, which means the situation, in spite of the Kurdish losses, remains substantively unchanged. The Kurdish interest is in securing Kurdish majority areas, not launching a general war to destroy Islamic State. The Islamic State retreat spells reversal but not yet disaster for the jihadists. It is unlikely that the Kurdish YPG and its rebel allies will wish to push further south and east. 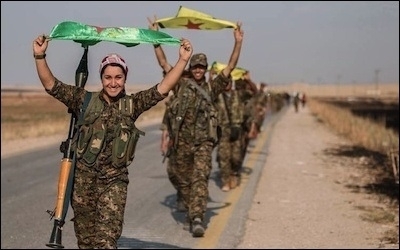 The Kurdish interest is in securing the cantons and areas of Kurdish majority , not in launching a general war for the destruction of Islamic State. But it is precisely the YPG's determination to secure Kurdish majority areas that has the Turks worried. With the Jazeera and Kobani cantons now united, the Kurds control a long contiguous stretch of the Syria-Turkey border. The Turks fear that the Kurds could seek to unite the canton of Kobani/Jazeera with the third autonomous zone, further west, around the city of Afrin. This prospect is what has led to the jitters in the senior reaches of Turkey's leadership. President Recep Tayyip Erdogan made a series of statements in recent days saying that Turkey would never allow the formation of another state in northern Syria. This is an allusion to the possibility of a Kurdish state. The presence of the Islamic State clearly exercises the Turkish leader less. Official Turkish media have begun to discuss the creation of a buffer zone in Syria. Since then, official Turkish media have begun to discuss the creation of a 112 km by 48 km buffer zone west of the Kobani enclave, taking in the town of Jarabulus and its environs. Evidently, the Turks are keen to establish Jarabulus, west of the Euphrates, as a redline beyond which the Kurds dare not advance without risking Turkish retribution. The Kurds responded swiftly to the Turkish threat. Murat Karayilan, a senior official and former leader of the Kurdistan Workers' Party (PKK), made clear that should the Turkish Army enter Rojava (Syrian Kurdistan), this would trigger Kurdish military action north of the border in Turkey itself. Interestingly, if such a buffer zone were to be established by Turkey, this would in effect constitute an intervention in Syria by Turkey directed not only against the Kurds, but also de facto in defense of Islamic State. It is the Sunni jihadists who control the area immediately west of the Kobani enclave. Such an intervention would be in direct contradiction to US and Western policy in northern Syria. It would also be contrary to the will of the leading parties of the opposition; and if it resulted in the deaths of Turkish soldiers, it would likely be unpopular domestically, at a time when Erdogan's AKP has just suffered an electoral setback. Turkish intervention would be in direct contradiction to US and Western policy in northern Syria. The Turkish military is also known to be unenthusiastic about the idea. Syria as a whole and northwest Syria in particular are a confusing mass of rival political and military groups. The potential for a Turkish force to become sucked into bloody local conflicts with no clear objective and no clear exit strategy would be immense. As of now, the battle in northern Syria between two very different quasi-state entities – the Kurdish cantons and the Islamic State – looks set to continue. The Kurds currently have the advantage. The recent, furious response of the jihadists in Tel Abyad and Kobani reflects this. But the war appears far from a conclusion.